At the sparsely-attended funeral of Dario Cueto, Agent Winter explains that they can no longer use the original Temple. A mysterious man explains that he has some space that will be the new Temple. The man is Cueto’s father (played by the same actor). Winter says that Dario’s murder was ordered by his father. Cueto’s father looks over his son’s body, taking the key from his neck before shutting the casket. At the new Temple, there is a ten-bell salute to Dario. The salute is interrupted by his father, who cuts a promo. 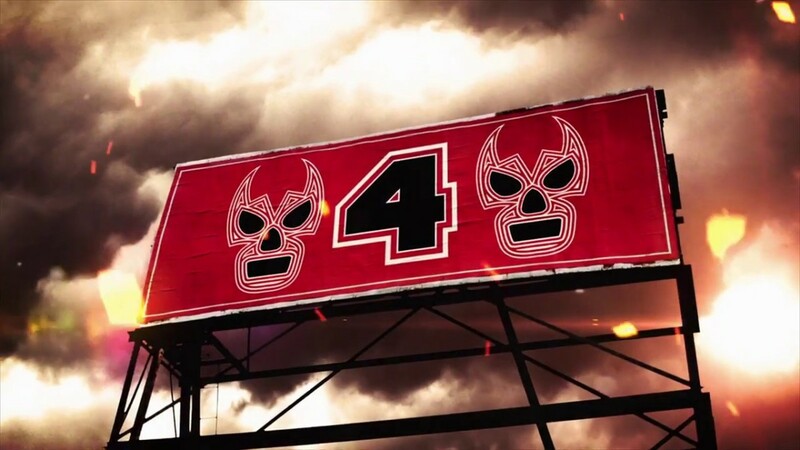 He says that his name is Antonio Cueto and that he is the new owner and promoter of Lucha Underground. He throws a portrait of Dario outside and then orders an Aztec Warfare match for the title. Mack and Killshot are in the ring. Antonio says that the Trios champs will be competing tonight as entrants 1 and 2. He says Dante Fox is missing in action, and that whatever luchador comes in at 3 will be their new partner. Melissa introduces their new partner: Son of Havoc. Mack and Killshot don’t seem to approve. Mack and Killshot work together against Son of Havoc early until Joey Ryan enters at 4. Ryan handcuffs himself to the ropes. Entrant 5 is Mr. Pectacular (aka Jessie Godderz). Killshot schoolboys Mack by surprise to eliminate him. Pentagon Dark enters at 6 and cleans house. Ryan takes off the handcuffs, but Pentagon quickly eliminates him. Killshot is eliminated by Havoc. Tommy Dreamer enters at 7 and throws a garbage can full of weapons into the ring as Pectacular is eliminated by Pentagon. Mariposa enters at 8, but quickly gets eliminated after a cutter by Havoc. Pentagon spears Dreamer into a pile of thumbtacks on the bleachers, then takes him back to the ring and eliminates him. Massaro comes in at 9 and beats up a pizza delivery man. He offers Pentagon a slice, but is met with a superkick and is swiftly dispatched with a Pentagon driver. Hernandez makes his return at 10. Pentagon immediately snaps his arm and eliminates him. Pentagon continues his dominance, eliminating Son of Havoc. Johnny Mundo enters at 11. Mundo and Pentagon go at it in the ring until Ricky Mundo, with a creepy doll, enters at 12. Johnny eliminates Ricky and Fenix enters at 13. Fenix cleans house. Jeremiah Crane (Sami Callihan) enters at 14. He and Fenix fight until Mil Muertes enters at 15. Muertes destroys everybody and poses, but Fenix eliminates him with a double stomp from the top rope. Daga enters at 16 with Cobra Moon. Chavo Guerrero is another surprise entrant at 17. Crane stares him down, and Pentagon catches him in a Pentagon driver for yet another elimination. Chavo then eliminates Fenix. Mundo hits End of the World to eliminate Daga and King Cuerno enters at 18. Dragon Azteca, Jr. enters the match at 19. Cobra Moon and Vibora come out and attack Mundo, who eliminated Daga earlier. Vibora is not in the match, but Marty Martinez is. He enters at 20. Vibora tombstones Mundo and exits the ring with Moon. Martinez pins Mundo. Cuerno hits a frog splash and eliminates Dragon Azteca, possibly sending a message to Chavo. Chavo eliminates Cuerno with a Gory Bomb. Pentagon superkicks Chavo and pins him. It’s down to Pentagon and Martinez. Martinez and Pentagon exchange blows until Marty gets a near fall. Marty hits a curb stomp for another near fall. Pentagon makes a quick comeback. He goes for the finish, but Marty bites him and hits a double underhook DDT for yet another near fall. Pentagon, exhausted and desperate, hits a flipping piledriver from the top and a package piledriver for the pin to retain the title: the first wrestler ever to do so in Aztec Warfare. Pentagon snaps Martinez's arm. Cueto congratulates the winner. He says that while Dario would have made him defend his title immediately, he’s a better promoter than Dario ever was. Therefore, next week, Pentagon will defend the title against his son, Matanza Cueto.